Oconee County’s 23.4 percent turnout in the May 20 primary election and 20.9 percent turnout in the July 22 runoff mask the fact that a smaller percentage of the county’s electorate participated in both elections. Only 16.1 percent of the electorate voted both in May and again in July, with another 7.2 percent participating in the May primary but not in the July runoff and 4.8 percent voting in the July runoff but not in the May election. A total of 5,147 voters went to the polls in May, and 4,586 went to the polls in July, for a difference of only 561 voters. 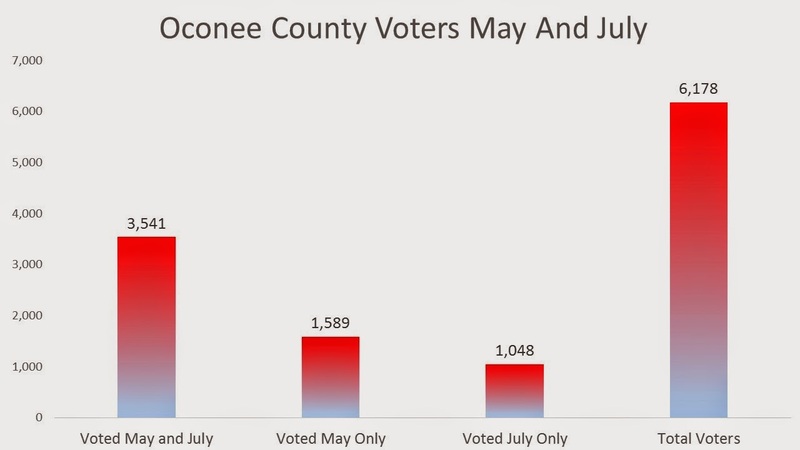 In fact, a total of 6,178 of Oconee County’s 21,985 registered voters–or 28.1 percent--went to the polls on May 20, July 22, or both of those dates, analysis of voting records from those two elections shows. Of the 4,585 Oconee County residents who voted with a Republican ballot in May, 74.7 percent also cast a ballot in July, while only 20.1 percent of the 533 who cast a Democratic ballot in May also voted in July. Those who voted with a Republican ballot in May had to vote with a Republic ballot in July if they wanted to vote in a party runoff. And those who voted with a Democratic ballot in May could only use a Democratic ballot in July. Of the 1,048 who cast a ballot in July but had not voted in May, 1,025 or 97.8 percent voted with a Republican ballot. Only a handful of people voted in the elections without choosing the ballot of either of the two parties conducting primaries. The July 22 runoff ballot for the Republican Party contained the names of two candidates for the party’s nomination for the U.S. Senate, for the U.S. House of Representatives, and for the State School Superintendent. It also contained the names of incumbent Margaret Hale and W.E. Wilkes, both seeking nomination for Post 3 on the Oconee County Board of Commissioners. They were the two candidates from the three-way race for that slot on the May ballot. Wilkes defeated Hale in the Oconee County Board of Commissioners Post 3 contest in July, with 51.2 percent of the vote. Democrats who voted in the July 22 runoff only were voting in the State School Superintendent race. Oconee County’s turnout rate in the May primary was higher than the statewide rate of 19.6 percent. The state has not released a final turnout rate for the July 22 runoff. Voting records are public documents that can be examined to prevent voter fraud. The public records indicate who votes in each individual election and, in the case of primary elections, which ballot the voter uses, that is, whether the voter chose to vote in the Democratic or Republican primary. Voters do not register by party in Georgia, and an individual can choose to vote in the primary of any party. The public records, of course, do not show for whom an individual actually voted. I obtained the electronic records available to the public from the May primary and the July runoff elections from the Oconee County Board of Elections and Registration. I merged the records from the two elections into a single data file to analyze which voters participated in the two elections.